There is nothing that comes close to the energy created when a group of smart and strong women come together to celebrate each other in pursuit of a common goal. That goal could be training for a championship race, a 5K, dominating the college halloween party scene as shown in the photo above, planning a wedding, a birthday party, a Bachelorette party, studying for a test, and/or sitting and listening to each other share ideas about how they can improve the presence of women in triathlon for themselves and for each other. In just a few days I will be taking part in the latter option, because I will be traveling to Tempe, Arizona to attend the first ever Outspoken Women in Triathlon Summit. The Outspoken Summit is a revolutionary event organized by Sara Gross and Lisa Ingarfield from Shift Sports, presented by Triathlete magazine, and hosted by LiveFeisty Media. The timing for the Summit is poignant for this tall redhead, because after spending three weeks left to my own devices, I am back to structured training this week. I was not a slug during that needful break, but it is nice to know I am back on the path toward my goals for next season. 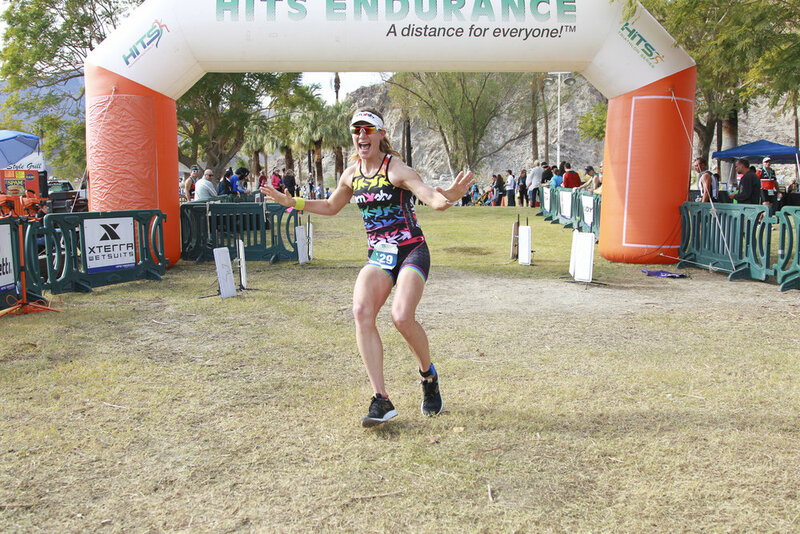 In fact, I spent this loose part of the season wisely by straightening up other aspects of my triathlete life that will set me up ready to hit it hard once the real fun starts. For example, I had my Dimond bike Simone tuned up, and new tires put on, but the front tire blew on my first ride last week, which honestly made me smile, because clearly the guys at the bike shop are not perfect, and sometimes replace tubes poorly like us mortals. Thankfully, I took their mistake as an opportunity to practice my exemplary tire and tube changing skills, and knocked out the task in record time, which for me means less than a ninety-minute podcast. I tactically tested the tire on fifty-mile ride on Sunday, and it passed with flying colors. Another overdue bike related task that is finally in motion, is replacing my trainer. I have had my trusty CyclopOps since 2009, but it was simply not achieving the resistance required for certain workouts, so hopefully the fresh one arriving next week will rise to the occasion. As far as water activities go, a highlight since Kona have been the relaxed swim sessions I have devised for myself because they have allowed me to practice my biggest hurdle in the pool, flip-turns, without the pressure of the clock. I have not slacked on the amount of swimming I have done, I know DeSWIMber is approaching, #alltheyards, but more importantly I have tried to keep my swim fitness intact because I will be taking part in a group pool session this Saturday that will be led by the top swimmers in triathlon, Haley Chura, Tenille Hoogland, and Hillary Biscay…. gulp. There is nary anything else in the world that makes me more nervous than swimming in front of my coach, (a world class swimmer), which is why I want to show up ready to go on Saturday. Please send positive thoughts. Screen left, a nervous triathlete about to jump into a swim skills session at Triathlon Camp in January under the watchful eye of her super-swimmer coach, screen right. I get to run on Sunday. Ragnar Wasatch Back Relay, 2014, where I ran 38 miles intermittently over 34 hours. It’s moments like this when I wonder, as I imagine many of you might, too, why I choose to take part in a sport that makes me constantly feel uncomfortable. The everyday reality of “there are so many things that can go wrong,” and huge expense of bike riding, coupled with the extensive time required to only slightly move the needle forward in my swimming progress, while I am already a pretty good runner, is indeed a head scratcher. 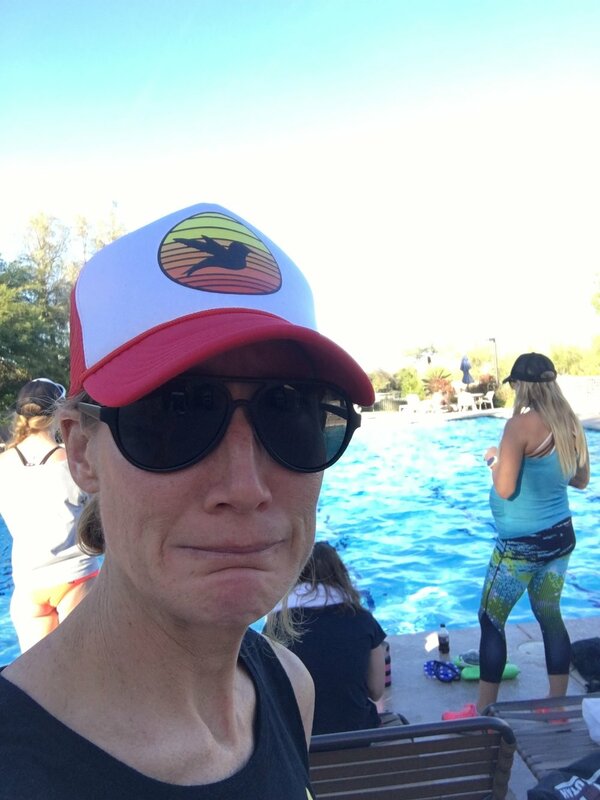 Why do I continually, year after year, put myself through the anguish of riding and swimming when I could just be a good runner? The answer is simple; being a triathlete has made me a good runner. Superfrog 70.3, 2017, one of my best rides ever. I am positive I kept up the blistering pace at the NYC marathon because my gigantic swimmer lungs gave me plenty of air to breathe, and my legs were strong enough to carry me the entire 26.2 miles at that pounding pace not just because of the many miles I have run on roads and trails, but from the thousands of miles I have ridden on Simone. The fact is triathlon, swimming, biking, and running, humbles and invigorates me every day. Pier to Pier swim finish, 2018. That is why the timing of the Outspoken Summit, an event where leaders, legends and everyday triathletes like myself, are joining together to help improve the present and future of women in triathlon is the perfect kick-off to the pursuit of my ultimate goal in triathlon... This is not really a grand reveal, I have either said it out loud, or not-so subtlety danced around it in recent posts on social media, but I am going to give everything I have and more to earn my pro card next season. However, even though earning my pro card is a huge personal goal, I am really going after it because reaching it would mean I could help other women reach their goals. Let me explain, the current system for pro Kona qualification allows for additional “floating” slots depending on the amount of pros signed up to race, which means the more women pros on the starting line, the greater the chances the top pros on the podium will earn a slot to Kona. The winners are guaranteed a spot, but that is it, everything else is up in the air. Therefore, if I actually receive my pro card, I would use it to chase down races that need more pro women to start in order to give the really fast ladies a better chance to earn a Kona qualification. I have zero concern for my crushed pride in finishing dead last in the pro standings if that last place finish could help the second place finisher earn her worthy spot on Dig Me beach. I loved my time racing in Kona this year, but I don’t need to go back any time soon. That means if I earn a Kona slot in an Ironman next season, but not my pro card, I will give up that slot to Kona in order to take another crack at earning my pro card at another race. Don’t worry; I am aware that this will be a HUGE challenge, but I have faith in my coach, myself, and in the spirit of triathlon to help me achieve it. No matter what happens, it will be worth it for the story. In the meantime, I know my time at the Summit this weekend will be extraordinary, and I promise to give a detailed rundown next week.